According to announcement by Government of Rajasthan, RAS Recruitment is going to conduct this year to recruit 980 skilled and self-motivated candidates for the Rajasthan Administrative Service posts. The Chief Minister of Rajasthan, Announce that their Government declared RAS Exam Notification in 1st week of April 2019. So you should be ready with hard preparation for RAS Pre exam Date June/July in Year 2019. You must be prepared for RAS 2019 Exam. Candidates who are waiting for RAS Exam 2019 Notification they can Apply for RAS 2019 Exam from April 2019 to May 2019. 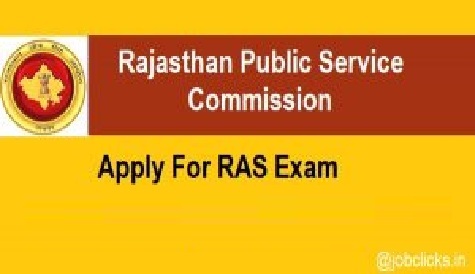 RPSC (Rajasthan Public Service Commission) is going to conduct RAS exam 2019 soon in June/July 2019 to recruit candidates on 980 posts. You can vacancy details in describe way by check news cutting below for RAS State wise posts, RAS vacant posts, Number of vacancies and pay scale (salary pay band). So if you are fresher waiting for RAS exam and if you are waiting for your next chance then you may get this opportunity this year by appear in RAS Pre Exam 2019. RPSC had been announced its official notification on its official website www.rpsc.rajasthan.gov.in. RAS posts in Additional Services: 575. Online Registration Start from: April 2019. RPSC RAS Mains 2019 Exam Date: Expected to hold in July 2019. Qualification: candidate wants to apply for RAS exam they should be Graduate from any recognized university. Final year students also can apply for RAS exam. You will aware about all other details by check official notification. ST, SC, BC, SBC Category Male will get : 5 year relaxation. ST, SC, BC, SBC Category Female will get : 10 year relaxation. Female from General Category: 5 year relaxation. Widow or divorce women: Age no Bar. General category PWD candidate: 10 years relaxation. BC and SBC category PWD candidates: 13 yeas relaxation. ST/ SC PWD Candidates: 15 years relaxation. Candidates eligible according to above eligibility criteria and have guds to become RAS officer, they can submit their participation in RAS Exam by fill online application form. You will get online application form by visit RPSC official website rpsc.rajsthan.gov.in. and you will be able to submit your application form by visit RPSC online portal rpsconline.rajasthan.gov.in. Link for apply online will be updates here after declare it officially. First you should keep in mind that you are submitting your application form online So Be carefully. If you submit your application form with any mistake than you can’t change after deadline. First you should read all apply online instruction carefully and take a review before click on final submit button. You should be ready with your scanned document in prefixed resolution criteria like your photograph and signature. After completion of RPSC RAS Application form 2019 online submission you should take a printout of your application form for further references. Exam Fee: candidate have to pay 250/- for General (Unreserved) candidates, 150/- for OBC and only 50/- for ST/SC and other reserved category candidates. You can submit your application fee by online mode using your net banking account or debit/credit card. RPSC will decide candidate selection by follow three steps. First candidate have to pass RAS pre examination then they will process for RAS Mains Examination. After pre and mains they will face personal interview round. RAS Preliminary (Pre.) Exam 2019: RAS Pre exam will consist all objective type questions from subject General Knowledge and General Science. RAS Pre Question will paper will consist maximum 200 marks question and candidates will get 3 hours to solve it. People who passed the RAS Pre level exam they will be able to appear in RAS Mains examination. RAS Mains question paper will consist brief types questions, medium type questions, long answer and descriptive type questions. Question paper will consist Sr. Secondary level General Hindi and General English questions. Personality test will carry 100 marks. RAS Examination Notification released and you can apply online for RPSC RAS Application form 2019 soon from April to May 2019. So you should be ready you can get more details about RAS Syllabus 2019 and RAS exam preparation books by check our website. You can also inspire by experts review on exam preparation.